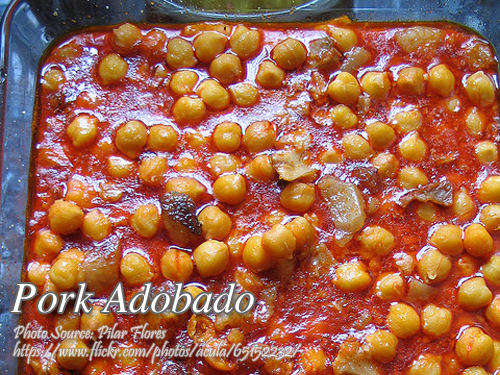 Adobado or adovada is a Spanish word meaning “marinated”. There are various ways of cooking adobado and various kinds of marinades but I guess this adobado recipe here is a Pinoy version. This version also reminds me of the dish menudo but most of the time it was not marinated first before cooking. Our method of cooking menudo is marinating the pork with soy sauce, kalamansi juice for 2 hours before cooking which makes it more tasty and flavorful. To cook pork adobado; Combine all ingredients in a pot and mix well. Marinate for an hour. Heat the pot and bring the mixture into a boil. Lower the heat and let it simmer until the pork is tender and the liquid thickens. Combine all ingredients in a pot and mix well. Marinate for an hour. Heat the pot and bring the mixture into a boil. Lower the heat and let it simmer until the pork is tender and the liquid thickens.